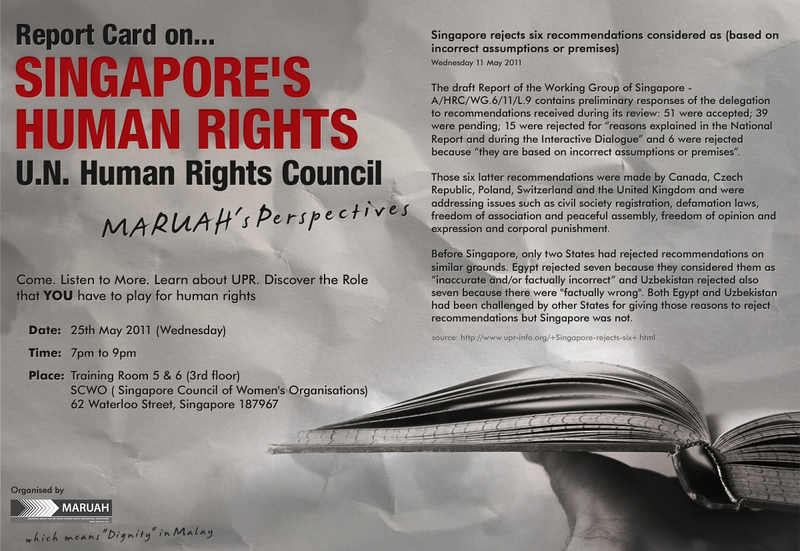 MARUAH (Working Group for an ASEAN Human Rights Mechanism, Singapore) is organising a post-Universal Periodic Review (UPR) discussion to share with you some of the key discussions that took place recently in Geneva when Singapore’s human rights record was reviewed at the United Nations (UN). It is a good opportunity for many to get on track with human rights discussions; for others to follow-up on the latest in Geneva; and for all of us to look at ways of going forward on some key areas. Please email maruahsg@gmail.com to register your attendance. This entry was posted on Thursday, May 19th, 2011 at 10:04 pm and is filed under Universal Periodic Review (UPR). You can follow any responses to this entry through the RSS 2.0 feed. You can leave a response, or trackback from your own site.